I have tried several times to make gluten-free bagels that satisfy me the way the regular wheat ones used to -- my favourite order at Tim Hortons. I finally am happy with this recipe. 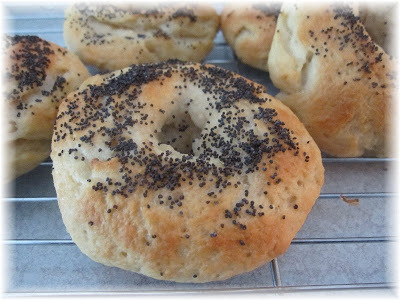 I like the plain bagels with poppy seed tops, toasted and spread with cream cheese but you can change up the recipe by adding your favourite flavours and toppings. I have tried several times to make gluten free bagels that satisfy me the way the regular wheat ones used to -- my favourite order at Tim Hortons. I finally am happy with this recipe. I like the plain bagels with poppy seed tops, toasted and spread with cream cheese but you can change up the recipe by adding your favourite flavours and toppings. Blend together all dry ingredients and set aside. Break egg whites in bowl of stand mixer and beat until frothy. Add proofed yeast and stir. Add all the dry ingredients all at once, stir until liquid is absorbed and then beat on higher speed until dough is smooth and elastic -- about 1 minute. Dough will be a little sticky -- that's good... turn it out on counter dusted with sweet rice flour. Knead lightly until dough is just nice to handle. Form a roll and cut it into 10 even pieces. Oiling hands liberally with olive oil. Take each piece and form into a round flat disk. Try to make it as as smooth as possible -- any cracks will magnify when baking. Place disk on parchment lined cookie sheet -- poke your finger down through the middle and twirl the disk around to form the centre hole of the bagel. Using fingers or fine pastry brush oil the tops of the bagels. Place pan of bagels in warm place to rise for about 45 minutes. Put pan of water on to boil -- make sure it is at least 1 1/2 inches deep -- the bigger the pan the more bagels can be boiled at one time. When bagels have finished rising, place them in the hot oven to flash bake them for 4 minutes. Remove them from the oven and turn the oven down to 375 degrees. Placing the bagels upside down in the boiling water, boil them for three minutes, then turn them right side up to boil for another three minutes. Lift them out of the water back onto the parchment lined pan. Using the egg white wash brush tops and add your favourite topping.